Creating an interior based around a specific colour scheme could be a challenge when looking for specific shades to match a required colour palette. Here at Spaceist, we work closely with our manufactures to bring our clients a wide selection of options to create their desired finish without compromising on vital product elements. 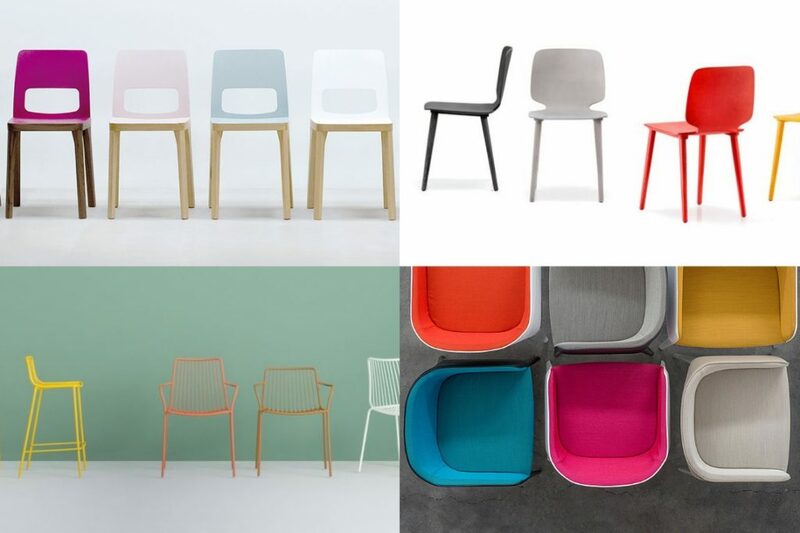 Here, present take inspiration from four different colour palettes and present a range of seating options that can be customised in a variety of colours to recreate the looks. To complement the neutral, wooden backdrop of the interior spaces, the furnishings have been selected in bright oranges and blue tones. These create an attractive and warm environment, adding elegant accents that work well with wooden tables and floors. 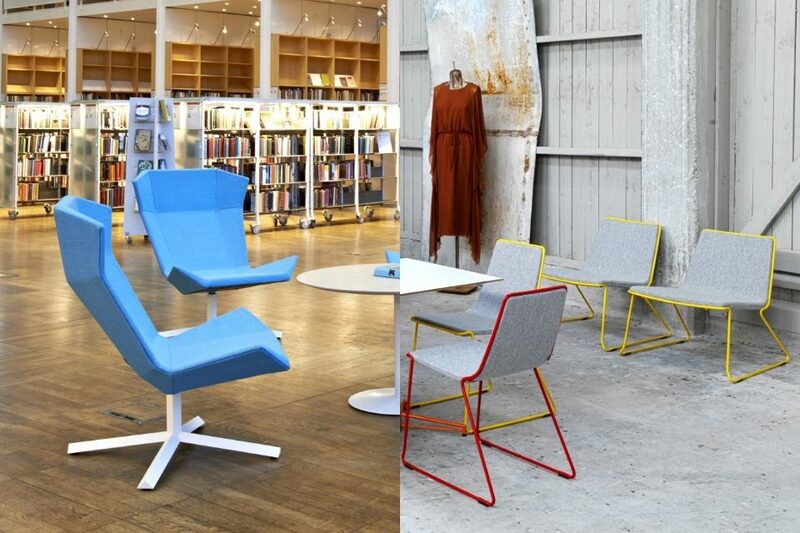 Recreate these bright tones with the study Pop chair available in selection of bright colours, including orange, royal blue, lime, and many more. The chair is composed of a reinforced polypropylene shell, giving it a highly durable property. 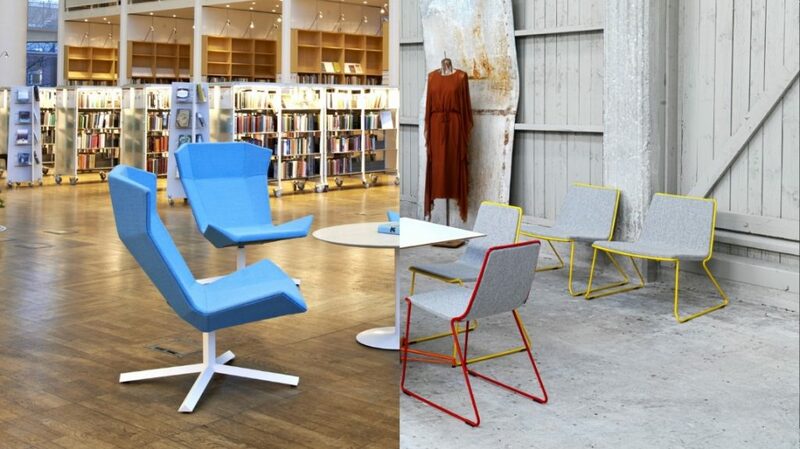 Another option, is the contemporary Ara café chair. 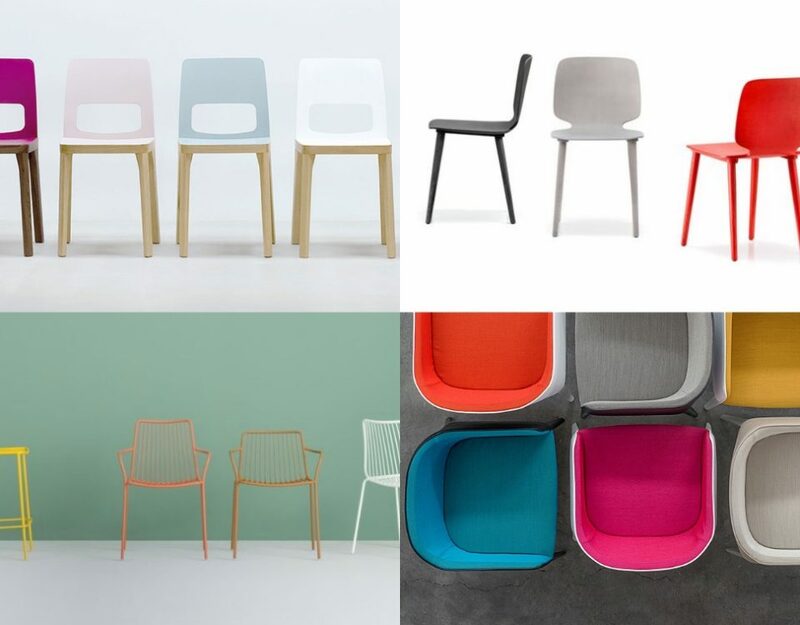 Moulded with polypropylene and finished with a fibreglass coating, these chairs are stackable and come with a selection of elegant tones, including blue, red and grey. Featuring a darker modish feel, Ethos Foods in London features a palette of blacks and purples to complement the marble. 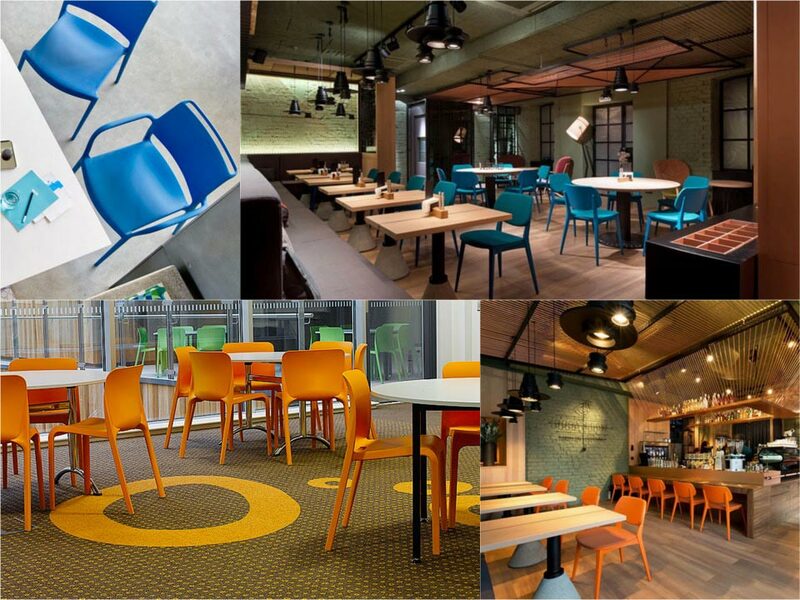 The mixture of furnishings also helps to break down the flexibility of choice allowing different groups of people to adapt to the range of options, from modular benches to chairs and booth style seating. Taking inspiration from Ethos Food restaurant, the mixture of furnishings begins with a choice of seating from the modular cubes range. 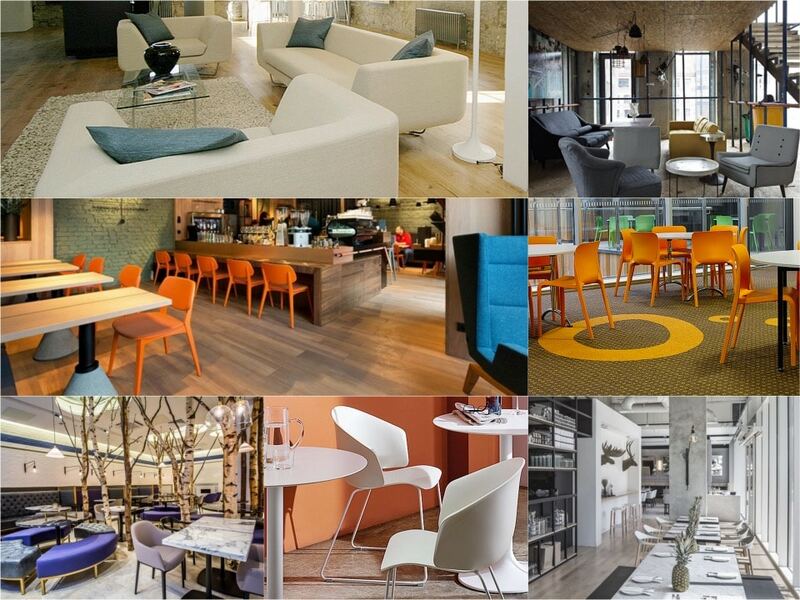 With over a 100 versatile colours to choose from, easy to maintain upholstery finishes and a flexible selection of sizes, the range makes an ideal choice for a flexible interior. The high back Modular sofa is another item from the Modular sofa range that works well in either a leather or vinyl finish to create booth seating. 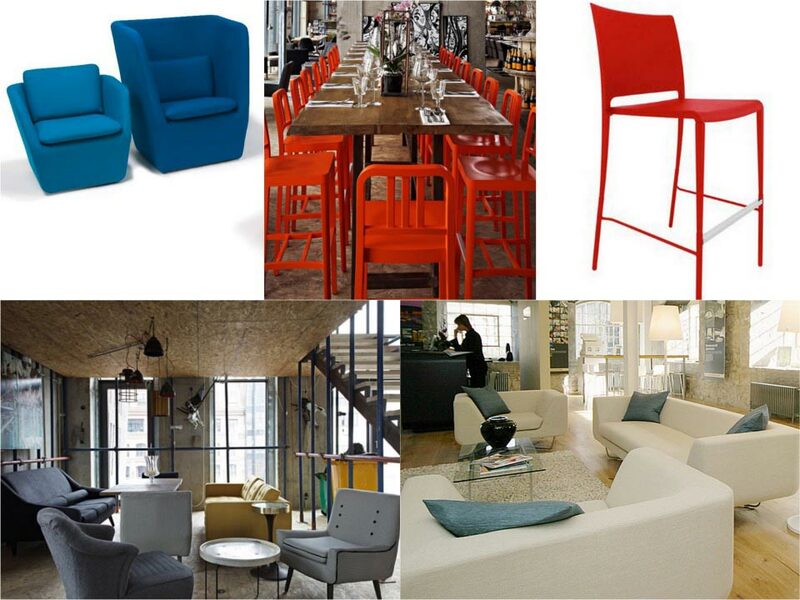 Complement the flexible modular seating with a range of stylish chairs from the Cabin bar chair range. 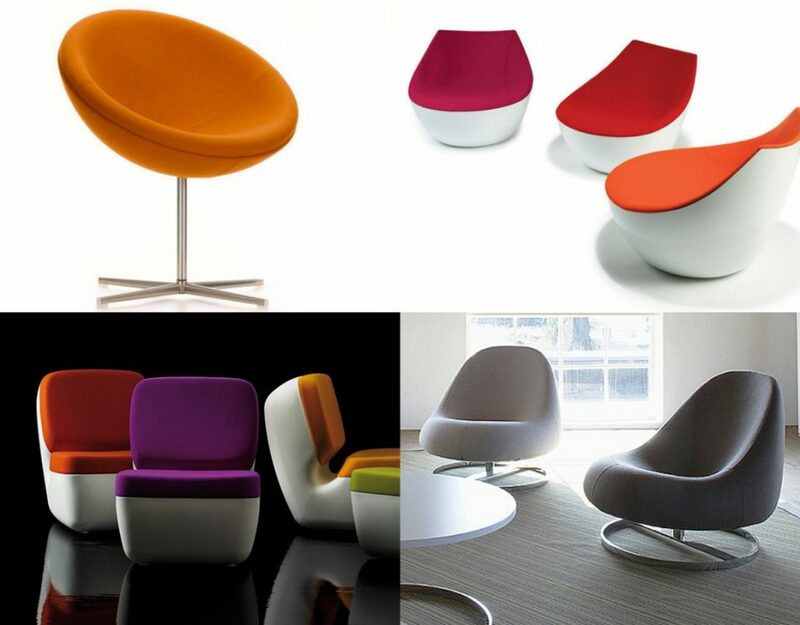 A stylish modern option, the chair comes with a choice of base options and comfortable padded foam seats. 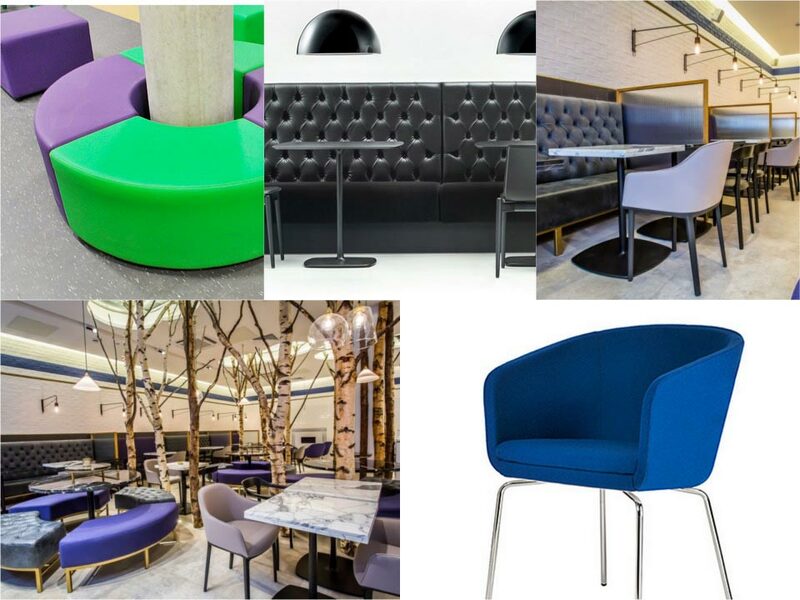 As well as a selection of seat colours, including purple, the seats are available in a selection of upholstery finishes that includes fabric, leather or vinyl. Also, the base comes in over 60 RAL colours. The use white furnishing offers a stunning finish to any interior scheme. Here the bold white and black scheme has been complemented with a range of white furnishings. The sleek and stylish finish of the white furnishings creates a chic and modish appeal. 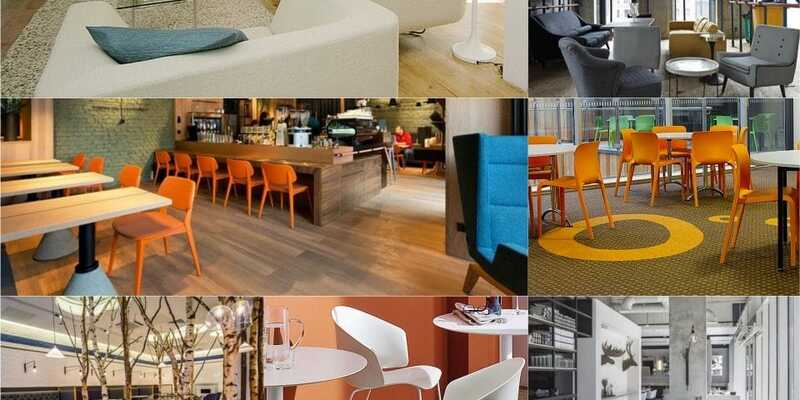 Presenting a solid wood chair available with a variety of seat and back colours, the Basel wood cafe chair is an ideal option for creating a stylish and contemporary interior scheme. The solid frame comes in an elegant solid beech or stained beech and is ideal for a range of uses, including cafés, office breakout areas and restaurants. 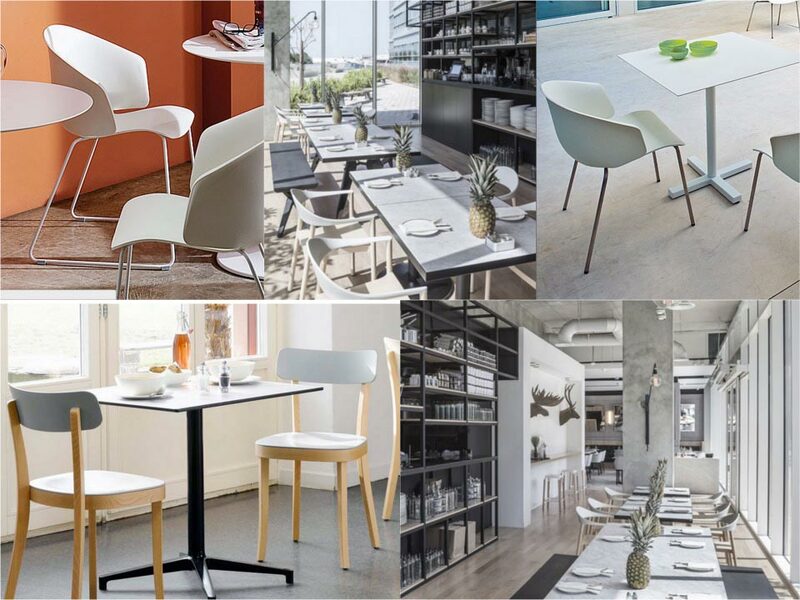 A practical and atheistically stylish option is the Grace café chair made from solid polypropylene and finished with a fibre glass coating. Offering ideal sturdiness with steel tube base legs, the Grace chair seat is moulded in a shapely form adding comfort. A modern, European inspired interior is presented at this pop up venue in central Moscow. The interiors are hip and up to date with a patellate of greys, pastel shades mixed with bold accents. The various spaces have been furnished to complement the use of each space. Relaxed seating in the bar and gallery spaces, whilst high bar stools and formal dining seating accommodates guests in the bar and restaurant spaces.